These Collage Ideas Are Fun and Creative. Some Collage Ideas to Unleash Your Creativity! Are you looking for some collage ideas to get you started with this interesting method of composing artworks? The word ‘collage’ comes from the French verb ‘coller’ meaning to stick or to glue. An artwork can be built up using a mixture of coloured papers, fabric, paint and photographs, as well as found objects to create an artwork that has texture, depth, movement and a sophistication born of experience. 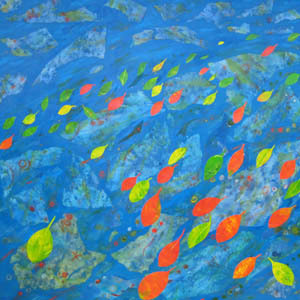 Here you see part of one of my large paintings titled ‘From the Islands’, a mixed media piece using paper, acrylic paint, dyed paper and silk, which captures a scene near Low Isles in tropical North Queensland, as brightly coloured mangrove leaves are carried out to sea on a waning tide. 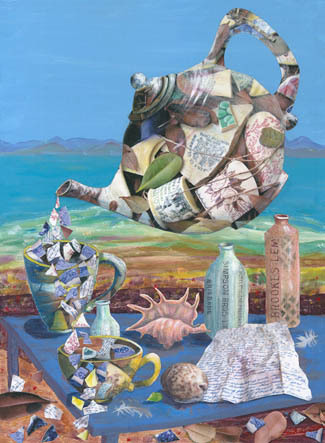 Often mixed media artists will use a mixture of drawing, painting and collage techniques in the development of their artwork. Collage making has the advantage that items such as pictures from magazines, your own paintings and drawings, newspaper cuttings, dried plant materials, in fact almost anything, can be played with and assembled, then changed around for the best effect before being glued into place. Creativity then comes as your collage ideas begin to form and you play with the subject, the colours, shapes and textures that have become your artist palette. 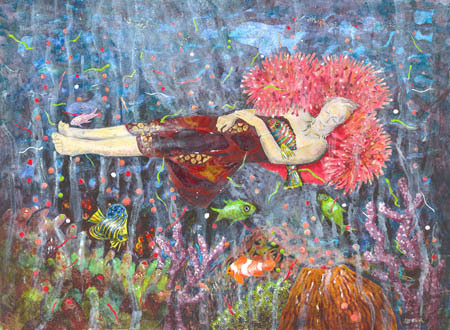 This painting is basically a collage with all the fish, a photograph of the dreaming woman, corals etc all being separate paintings, cut out and glued together for a three dimensional effect. The sarong worn by the dreamer is actual silk. It tells another, more recent story. A group of artists had gone out on the island lagoon in a small dinghy to observe the coral spawning. Some of the more intrepid swam back for shore, in the dark, heading for the lighthouse. It's not just the coral that spawns but fish, snails, oysters and all manner of worms. The water is luminescent and thick and cloudy with all this activity so Chris was ready for a good rest, which is how I photographed her after she had showered. See the fish nibbling her toe? This seemed a subject brimming over with collage ideas! Try positioning your torn up magazines, photographs and drawings on top of a section of a painting. Does their juxtaposition enhance the point that you are trying to make? Is it now more meaningful or descriptive? Add your final shape or item – perhaps a seashell, feather, even a coin if these objects add to the meaning of the whole. Change the positioning until the composition looks just right, de-clutter and…glue. Be sure to use an acid-free glue that is compatible with your other papers if you want your artwork to last. Collage online: if you are comfortable with making digital art, what could be more fun than manipulating parts of photos, drawings and scanned paintings to make a virtual collage? This painting, ‘The Blue Table’ examines the idea of the loneliness and isolation of lighthouse keepers’ wives living on the island in by-gone days when communication was through passing sailing ships and the occasional letter from ‘the old country’ delivered overland by horses or T model Fords then by dinghy! Collage techniques that I used involved photographing actual pieces of broken crockery found on the island’s beaches, working into them with coloured pencil for a 3D effect, taking ‘rubbings’ from old bottles also found there, writing an imaginary letter and photographing it at an angle along with cut up pieces of a scanned and printed image of an old plate from my mother’s youth. The whole was then arranged as part of a painting of the table and the ocean and mainland beyond. Also known as montage (or photo-montage) various collage techniques were used by exponents of modernism, particularly by Georges Braque and Pablo Picasso. Collage making could almost be considered as a form of bas-relief sculpture whereby collage ideas are used with to wood, found objects and bark. So the differences between a collage painting and sculpture become blurred. Photo-montage or photo-assemblage is a variation on the collage making process. Cut up and cut out printed photographs are assembled, the final result then being re-photographed to make a finished piece. This process is used, of course in advertising and other digital art through computer graphics programmes such as Adobe Photoshop.